Shortly before the throw-off for the Women’s EHF EURO 2018 in France (29 November to 16 December), the French Handball Federation gathers international experts for its second medical congress to be held on 16/17 November. 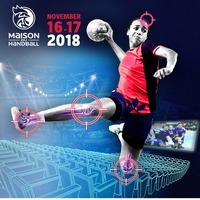 The question “What does being a therapist for team sports mean today?” will be at the heart of the event which is organised in the federation’s new ‘Maison du Handball’. “The FFHB, true to its ideas and philosophy, organises a congress that will give prominence to the daily activities of all the ‘medical crew’, doctors, physiotherapists, podiatrists, specialists etc, and will put this ‘side-action’ in the spotlight,” says Gérard Juin, medical director of the French federation. “Handball is still developing, and so is its medicine. To stay in touch with the reality of our time, it needs to be about sharing and being accessible to all. “There is no such thing as a champions’ exclusive domain. A health-related sport is a shared concern. Experience and techniques will benefit from not remaining protected content but, on the contrary, being shared,” he says. The congress is organised by the French Handball Federation in cooperation with the Luxemburg Institute of Health (LIH), the European Society of Sports traumatology, Knee surgery and Arthroscopy (ESSKA), the Société Française des Masseurs-Kinésithérapeutes du Sport (SFMKS), the Institut National du Sport, de l’Expertise et de la Performance (INSEP) and the European Handball Federation. More information is available on the congress’ official website, www.icmhb.net. Registration (€120 for both days) is also possible via the website. The congress offers simultaneous translation for its international attendees.